Luggage… check. Round trip plane tickets… check. Carry-on bag… check. Looks like you and your party are ready to head to the airport to catch your flight. The only problem is that getting to your flight gate is easier said than done. You must check your luggage, pass security and grab some food, all the while avoiding getting bogged down by the hustle and bustle of the terminal. Make sure to not leave anyone in your party behind and… don’t miss your plane! The goal of the game is to have the most Victory Points (VP) at the end of the game. 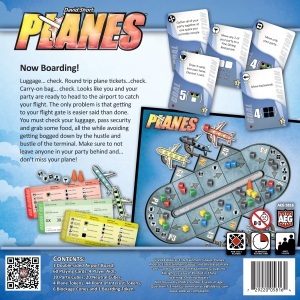 You gain Victory Points by boarding your party on your plane and by completing the goals on your cards. Your cards not only allow you to take special actions in order to board your plane more quickly, but they will also allow you to score goals, which are your key to victory. 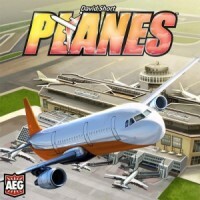 Designed by David Short, Planes is the exciting new game in AEG’s Destination Fun series! Continue your travels in the acclaimed Trains boardgame. Click here to check out the design diary by David Short. Add a Review for "Planes"